Earlier last month Hookedblog posted about the Selected Moments exhibition which saw artists Remi/Rough & Stormie Mills head up north for a residency at Newcastle’s Unit 44 gallery space. The two artists collaborated together at Unit 44 over the space of a week creating ten original artworks for the Stolen Moments show. Alongside the studio work the duo also painted this huge wall, beautifully captured above by photographer, Ian Cox. 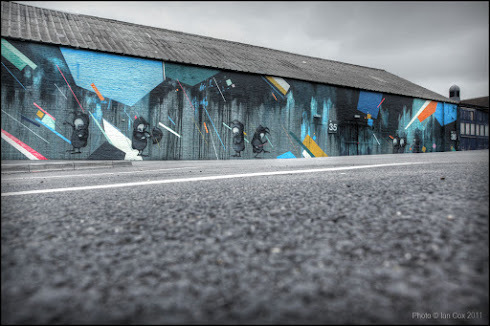 The wall was painted at Hoults Yard as part of the White Walls project which the guys at Unit 44 are also running and has seen murals from previous visiting artists which included SheOne, Jon Burgerman, Roa, Insa and Kid Acne. This video documenting the two artists creating their canvas work for the show has just been posted online. The clip was shot and edited by David Bilbrough who was on site at Unit44 throughout the week long residency. The show runs until the end of June at Unit44 and all the work can be found in the 'gallery' section of the Unit-44 website.